The US will end up hurting its own domestic industry that relies on cheaper material and goods from India, as duty free access is cut off for Indian products. Exporters remained convinced that while loss of benefits under the Generalized System of Preferences (GSP) scheme will squeeze margins and make competitiveness difficult, the overall impact will be minimal on the domestic industry. “India’s exports to the US stood at $50.57 billion in 2017 with a GSP tariff advantage of only $190 million. This is less than 0.4 per cent of our exports. 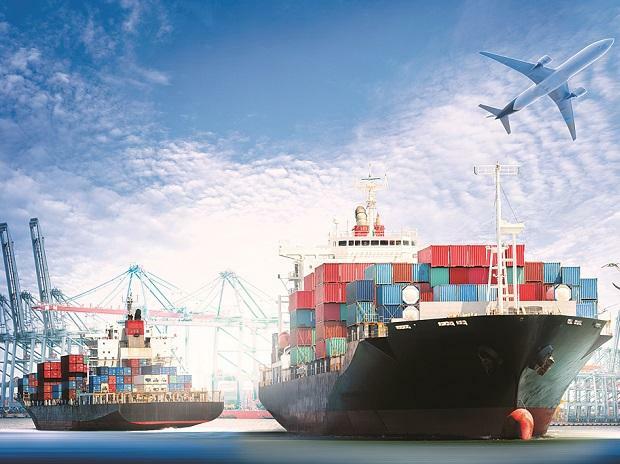 Naturally, its withdrawal will have a marginal impact,” said Ganesh Kumar Gupta, president of the Federation of Indian Export Organisations (FIEO). In 2017-18, total exports to the US stood at $47.87 billion, more than a 13 per cent rise over the previous year. It is expected to remain unaffected even if the GSP is removed, said senior commerce department officials, adding that in-house research proved this. However, with India predominantly exporting intermediate and semi-manufactured goods to the US under the GSP, it has helped in cost effectiveness and price competitiveness of the US downstream industry, Gupta added. Therefore, the GSP withdrawal will also affect the competitiveness of many manufacturing sectors and will hit the consumers at the same time. The import price of most of the chemicals products, which constituted a large chunk of India’s exports, is expected to increase by about 5 per cent. 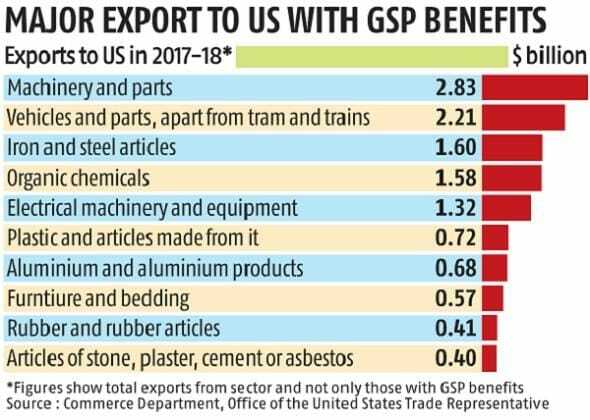 The withdrawal of GSP benefit will also hit the import-diversification strategy of the US, where it is keen to replace China as the main supplier to other developing countries, according to FIEO. The list of items eligible to receive GSP benefits from India is significantly large, at more than 3,700. Of this, India managed to export only 1,900 kinds of items. Since, the items are spread across 13 sectors, and gamut of overall trade is so large, we expect little impact, a senior functionary of the Engineering Export Promotion Council said. However, worries remain for loss of competitive advantage over other comparable economies which operate on similar labour and tariff levels such as India such as Bangladesh, Malaysia and Vietnam. “I am sure the government would take appropriate action and there will be dialogue between the two governments to make sure that this is not withdrawn in case of India,” said Ficci President Sandip Somany. However, the policy implications of a major trade partner making a unilateral move such as this irked traders and experts alike. The basic tenets of GSP dictate that it is provided on a non-reciprocal basis, but the Donald Trump administration has linked it with market access and tariff reduction, issues that are perpetually under discussion. “India is well within its rights to lodge a complaint at the World Trade Organization regarding the latest move. It has already been established earlier that GSP benefits cannot be held ransom and retaliatory demands made. India had won a case at the multilateral platform after the European Union initiated a similar policy,” trade expert Abhijit Das, head of the Centre for WTO Studies, said. India is getting tariff preference on 5,111 tariff lines out of 18,770 tariff lines in the US. However, on only 2,165 tariff lines, the tariff advantage was 4 per cent or more, according to a FIEO study. While exporters would be able to absorb the duty loss wherever it is in the range of 2-3 per cent, we need to provide fiscal support to those products where GSP tariff advantage was significant. Diverse items such as processed food, plastic products, building material & tiles; hand tools and certain engineering goods as well as cycles and home furnishings are eligible for higher GSP benefits. Exporter bodies urged the commerce department to provide specific support on product market matrix for exports to US with a view that the landed price of such products remains more or less what was under the GSP regime.